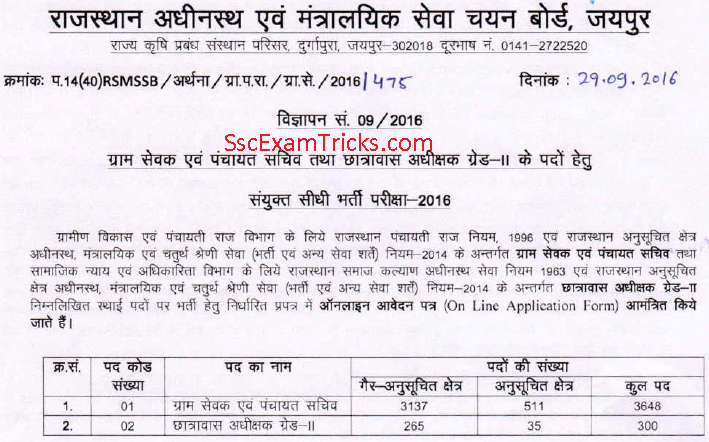 RSMSSB Gram Sevak Admit Card 2016 - Download Rajasthan Panchayat Sachiv Hall Ticket 2016 – RSMSSB Rajasthan Gram Sevak Interview Call Letter 2017. The RSMSSB Gram Sevak Admit card is likely to be available on 02nd to 05th November 2016 on website www.rsmssb.rajasthan.gov.in. The exam date has been declared by the Rajasthan selection board. The exam is on 18th December 2016. The intimation to upload RSMSSB Gram Sevak Admit Card will be provided in the newspapers and board’s official website www.rsmssb.rajasthan.gov.in. The candidates will have to use application ID and token number which is provided after submitting application form fee for the advertised posts. The intimation will also be sent to your email ID and mobile number through email and SMS respectively. Earlier RSMSSB Recruitment for Gram Sevak or Panchayat Sachiv had started in September 2016. The notification was published on 29th September 2016 in which recruitment process to be completed through online mode was mentioned. The online application submission was organized from 01st – 31st October 2016. Huge numbers of eligible candidates had applied for these posts. The candidates must score at least 40% to qualify this written test which means that they shall score 40 marks (out of 100 marks) to be succeed for further stage i.e. interview. The cut off marks will be prepared for these qualified candidates to shortlist the candidates for interview. The base for interview is ‘Better the score better the chances to get into interview list’ for the candidates. Latest Updates: Rajasthan Gram Sevak Admit card is expected to be available in the first week of November 2016 on official website www.recruitment.rajasthan.gov.in or www.rsmssb.rajasthan.gov.in. Those candidates who are going to appear in the exam; they can download it from direct link given here. Mind that no Admit card will be sent by post to the candidates. 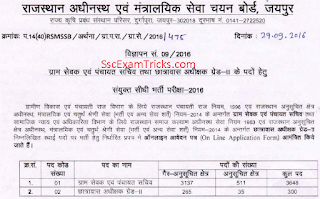 The RSMSSB Gram Sevak Admit Card will be uploaded online on the official website www.rsmssb.rajasthan.gov.in. The following procedure can be adopted to download RSMSSB Gram Sevak Hall ticket for the exam. 1. Visit the official website www.recuitment.rajasthan.gov.in. 2. Check the link which would be activated as ‘Get Admit Card’ and provided on the left side of the official page. 3. You will have to login your by providing application number and token numbers on that page. 4. Press ‘Login’ button. Now you can assess your account and also check out the downloaded Rajasthan Gram / Panchayat Sachiv Hall ticket. Don’t fail to recall at least one photo identity proof before going to the examination hall.